The idea that “student loans are just student loans” is the very idea that gets students into lasting debt. 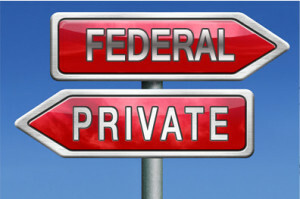 There are major differences between federal and private loans that include leniency to debt repayment, loan forgiveness, interest rates, and consequences for default on payments. Federal student loans can be better for students because it does not entrap or wring a student out for money when the collection day arrives. With these types of student loans the federal government will sometimes subsidize the loan while the student is still in school. Another benefit of federal loans is the interest rate is usually fixed. When paying the student loan back, federal student loans are better because a student can limit the amount he or she must pay back each month based on the student’s income. Federal student loans also have benefits for certain people, for example: borrowers pursuing careers in public service may have loan forgiveness available for them after 10 years. Federal student loans also contain important borrower protections such as: options to delay payments, discharge of debt upon a borrower’s death, and discharge of debt upon permanent disability. The disadvantages of federal student loans occur when a student defaults on his or her payments. The government has more resources than private lenders to compel repayment of student loans as they can garnish up to 15% of a debtor’s Social Security, disability, and retirement benefit payments without ever going to court. If a student defaults he or she can miss out of their tax refund as well. Private student loans are any student loans that are not federal student loans and they come from banks, credit unions, or other lenders. Private student loans do not offer flexible repayment terms or even borrower protections. The bank or lender sets the interest rate, loan limits, terms, and conditions on the student loan. To get a private student loan the lender will check a student’s credit score or the credit score of the co-signer if there is one. Private student loans usually have a variable interest rate that can rise and subsequently increase the amount of a student’s payments. The collection practices by lenders of private student loans are stricter and there are fewer options to reduce the size of payments. Private student loans are often transferred into trusts with little records kept and so it is not uncommon for an individual with a private student loan to be sued, after he or she defaults on payment by someone they did not even know had their loan. Federal or private, student loans are still the second leading debt in this country and despite which debt is easier on the one who is intended to pay it, steps need to be taken to create student loans reforms.